MacGyver takes a swing at someone on the beaches of Hawaii. After a massive earthquake in Hawaii traps a group of government scientists, Mac and Jack are tasked with the dangerous rescue; thankfully, they get some help from the locals, including Kono Kalakaua and Chin Ho Kelly from the Hawaii Five-0 Task Force. The mission becomes even more deadly when the fierce foursome realize criminals are using the quake's chaos as a distraction to steal top-secret weaponry. Will this action-packed quartet catch the bad guys and save the scientists? 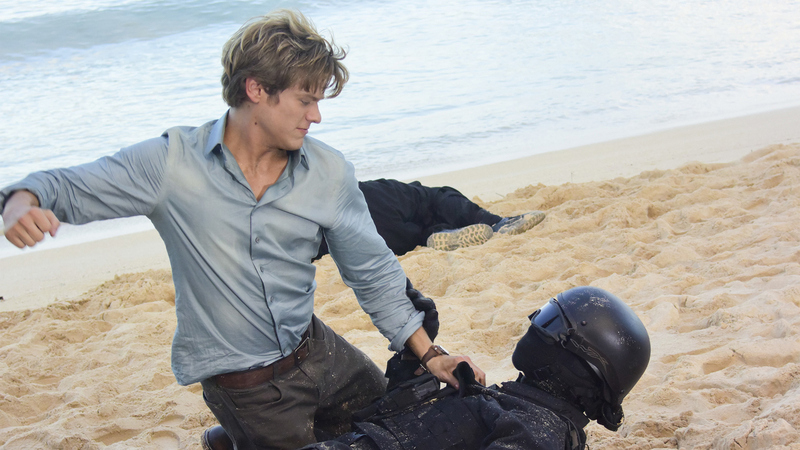 Watch a special MacGvyer and Hawaii Five-0 crossover event on an all-new episode of MacGyver entitled "Flashlight," which airs on Friday, Mar. 10 at 8/7c on CBS and CBS All Access.